COMPLETE INSULATION-The Chambers oven is super-insulated with a thick wall of best grade rock wool on all six sides-top, bottom, front, back and sides. This amount of insulating material, when fluffed up, makes a pile almost as big as the entire range itself. Such heavy insulation requires a TRIPLE OVEN WALL-The outside porcelain has to be hung on as a beautiful, smooth, easy-to-clean apron beyond the actual outside oven hull. Therefore, panels can be changed without affecting the insulation in any way. The Chambers oven is ventilated by a system of controls and dampers scientifically designed for perfect circulation of fresh air throughout. 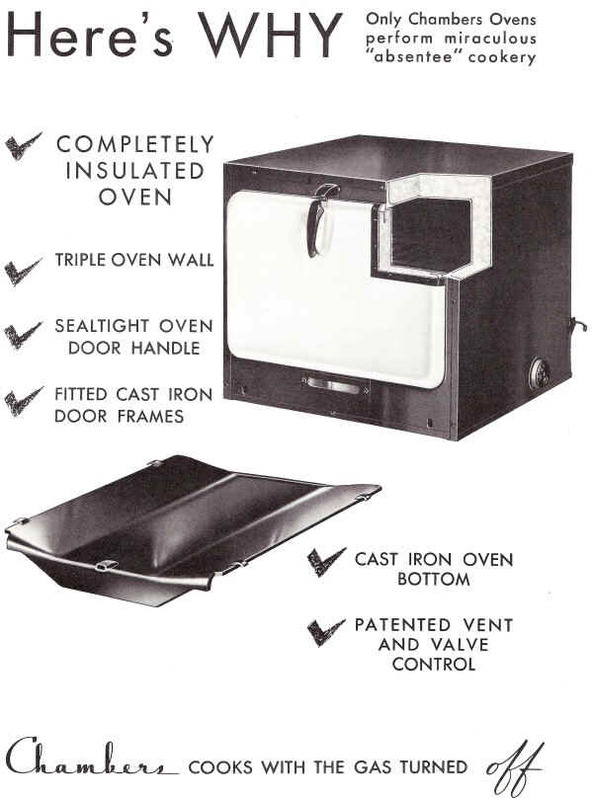 THE PATENTED VENT AND VALVE CONTROL permits the oven to be sealed up tightly simply by turning off the gas. Fresh, circulating air while the gas is on-sealed-in heat when the gas is off. SEAL TIGHT OVEN DOOR HANDLE prevents escape of heat around oven door. It helps to retain heat inside the oven where it should be. It, too, is found only on Chambers Ranges. CAST IRON DOOR FRAMES also hold heat inside oven where it should be, because they are ground to fit and they are checked and double checked in the manufacture . of Chambers Ranges-still another unusual feature. CAST IRON OVEN BOTTOM weighing approximately 18 pounds, is scientifically designed to insure perfect heat circulation. No more burned-out oven bottoms!